Season’s Greetings to all of my students and followers and families. Here’s to a peaceful Christmas, end of the year celebrations and prosperity in the new year. December is a busy time for teacher and it is nicknamed the month of teacher’s running. That is the truth for me this year. Not only am I preparing for the holidays, hatsugama and tea lessons, but am also sewing and making bags for the SweetPersimmon store. More about that later. Hatsugama invitations should be in the mail soon. Please mark your calendars for Saturday January 14th. Don’t forget this coming Sunday the 18th is Kagetsu study at 1:30 at Mieko sensei’s house. New introduction and tray style classes are forming for January. Please let me know if you have friends who may be interested. I’ll post and send emails soon. In the meantime, some of my students are looking at acquiring a kama. It is a big commitment to purchase one, but when you see the work that goes into making one, it is well worth the price. 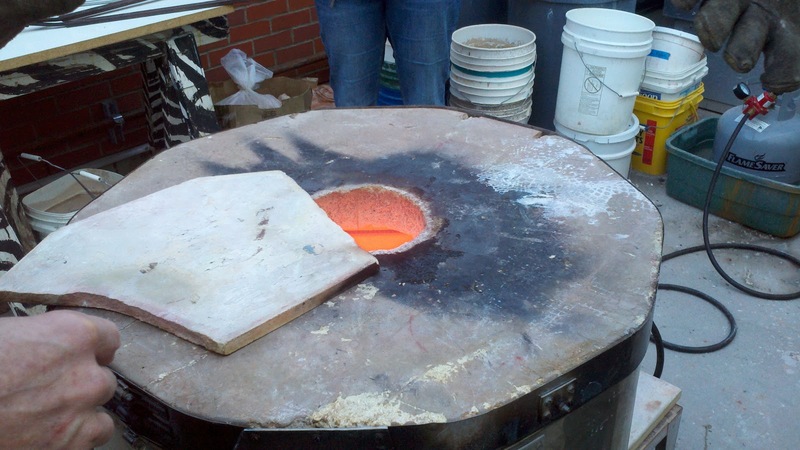 Each Kama is one of a kind since they break the mold after casting. It normally takes 3 months to go through the process and compltete a kama. If you take care of your kama, it will last a lifetime. We are fortunate to have on loan from Tim-sensei in Seattle a beautiful Ro kama made by the famous Keitan Takahashi. This kama was made in the early 1960s before he was named a living national treasure in Japan. He passed away in 1999. Below are videos showing the work that goes into making a kama and some of the beautiful work by Keitan Takahashi. Please enjoy. For my regular readers, I apologize for not blogging in a long, long time. I dressed the students in my introduction class in kimono and we went into the tea room to have tea. Don’t they look great? We only have two more classes left and it has really gone fast. New classes are forming now for January. Another introduction class, a beginner class, and continuing class for advanced students. Don’t forget, we have a monthy kagetsu class this Sunday, November 20. Stay tuned for the kaiskei cooking class and other workshops including altering kimono, kobukusa making and sweets making class. New Introduction to Chado, the way of tea classes forming now. Students will learn the etiquette of how to be a guest at a tea ceremony, the basic order of the tea ceremony and how to whisk green powdered ceremonial tea. Students will also participate in 4 Japanese tea ceremonies from informal to semi-formal tea gatherings. An overview of Japanese aesthetics and how tea has influenced Japanese culture will be presented. Students will also be introduced to tea ceramics, calligraphy, kimono dressing, and incense ceremony. They will also be introduced to zazen meditation and discuss how to put tea practice into every day life. The husband of one of my students made a video about the recovery efforts in Japan. I hope you will take heart that things are beginning to get better for the people in Tohoku after the earthquake and tsunami. Sometimes person may feel embarrassed to ask questions. That embarrassment should be set aside and questions asked. One must discard all embarrassment when training in tea for this is the foundation of mastery. One should abandon feelings of embarrassment and ask people questions; this is the keystone to become adept. This poem can be interpreted in many ways, but to my thinking, I would like to put the emphasis on not being embarrassed rather than asking the questions. In the previous poem, learning by looking and studying is emphasized, so before you ask questions, take time to look, study and reflect on what it is that you have a question about. The matter of asking questions comes up quite often with my students. In a lot of learning situations here, asking questions, having discussions and debates show the teacher that you are engaged and participating. But as I wrote in this post, there are appropriate times and appropriate questions. And don’t forget, the poem doesn’t say ask your teacher, there are other students in class, and your sempai (senior students) who may have asked the question previously who may be willing to help you out. As for feeling embarrassed, some people have no problem with this, others may feel embarrassed because they are beginners, or more junior than everyone else. This is the time to discard your embarrassment. We were all beginners at one time. You are here on the path and everyone has his own journey in his own time. Ask your sensei if you may ask a question, or if it is an appropriate time to ask a question. Don’t be embarrassed. Saturday September 17 – Portland Japanese Garden, Tea presentation 1 and 2 pm, free with admission to the garden, please come join us. To my readers, I apologize for the lapse in blogging this last month. I will do better going forward. For those of you who have emailed me asking if I was going to continue blogging and if I am okay, thank you and yes, I am okay just very busy this summer. I would like to express my gratitude to my design and construction manager, my husband. As you can see, he does beautiful work. It was his ideas to take the old book of tea utensils apart and apply them to the fusuma. 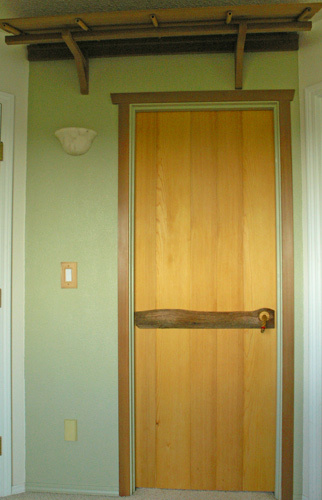 He also wanted to incorporate the piece of wood given to us in the door and door handle. And the shoji lamp with its curved supports are all his own design and execution. Thank you so much. Thank you also to my students who were patiently waiting for the tea room to be done. We can now have classes here again. One learns by looking and studying. Without understanding completely one cannot criticize. In the learning process, watch and learn. Voicing opinions without having done this is foolishness. Learning the way of tea is difficult. At first, many things just don’t make sense, everything is strange and it seems like you cannot control your own body in the tea room. In a situation like this it is best to observe and get the lay of the land. When I was in Midorikai, in orientation on the first day, Mori sensei advised us that the key to learning chado in Kyoto was sunao no kokoro ???. This means an open heart, ready to just accept anything from anyone. People in Kyoto lived and breathed they way of tea and just about everyone there knew more about tea than we did, even if we had studied at home for 25 years. If I resisted, justified, offered excuses or complained, people were not likely to share their knowledge. He told me there were vast riches there about the way of tea, but I would have to become sunao. He said that sunao meant open without resistance, to take in everything as part of my training. To explain, offer excuse, or justify myself showed that I was not open but resisting the learning. I wrote more about this in the post Just say hai. Criticizing is just a way to resist what is being taught. So is arguing and disagreeing with the teacher. Mori sensei said to just experience whatever the learning is, then reflect upon it later. You will come upon insights and grasp not only what the teacher was trying to convey, but also the lessons that you were meant to learn. Sometimes when I talk to people who are interested in studying the way of tea, they demur when I tell them the introduction class is 10 weeks long. I even had someone ask me if I could shorten that to two weeks because that was all that he could commit to for a class. For some people it is hard to make a commitment of ten weeks. For some people making a commitment at all is hard. I understand. I have had problems with commitment in the past. For those who have trouble with commitment there is always the possibility of making a wrong choice and being stuck. There are those who never have enough time to commit, or enough money, or enough support or enough…. But I have learned the power of commitment. It is hard to close off your options and follow through on the one you have committed to, but once you have chosen a path, there is almost a relief that the choice is made, and movement is now possible. If one is committed, there is no buyer’s remorse. If one is committed, the narrowing of focus gives you energy. If one is committed things seem much clearer to you. If one is committed you can see the end game and all its rewards. Concerning all acts of initiative (and creation) there one elementary truth, the ignorance of which kills countless ideas and splendid plans: that the moment one definitely commits oneself, then providence moves too. All sorts of things occur to help one that would not otherwise have occurred. A whole stream of events issues from the decision, raising in one’s favor all manner of unforeseen incidents and meetings and material assistance which no man would have dreamed would come his way. I have learned a deep respect for one of Goethe’s couplets: “Whatever you can do, or dream you can, begin it. Boldness has genius, magic and power in it. Begin it now.” ~W.H. Murray, The Scottish Himalayan Expedition. Someone referred to me recently as a tea master, and I was embarrassed enough to correct them by saying I was still a student of tea. In truth I still feel like such a novice on this path; there is still so much to learn. They say that it takes about 10,000 hours to become an expert at something. By that definition, if you went to keiko for an hour and a half once a week, it would take a little more than 128 years for you to become an expert at chado, at least 2 lifetimes and perhaps more if you don’t count formative years. We could take a single aspect of the way of tea, tea ceramics, for example, and say you spent 40 hours a week just immersed in it, it would still take you nearly 5 years to become an expert. Yet you could spend 30 years studying tea ceramics and still not know all there was to know about it. Take that and multiply it by the many other aspects of the way of tea: flower arranging, gardening, architecture, calligraphy, cooking, sweet making, literature, poetry, history, etiquette, kimono, wood working, lacquer, Zen, and those years add up very quickly. Not to mention studying the hundreds of tea procedures, tea utensils and types of tea gatherings. When people are first exposed to chanoyu, it seems so deceptively simple that anyone can do it. What they don’t know is that it has taken years of practice to make it look simple. But even people just coming upon it can tell the difference between a beginner and a more experienced tea person. Why is that? I believe that watching an experienced tea person, you are not just seeing the procedure for making tea. You are experiencing the heart of chanoyu. The experienced practitioner imbues the temae with his or her heart and consideration for others. When you and your body know the procedure by heart, you don’t need to think about what comes next. You can free your mind to concentrate on the guest. There is no room for stage fright, or making mistakes. The movements flow and awareness and feelings fill the room. When the guest is experienced too, there is a magic that happens as host and guest become one. Both are of the same mind and both contribute to creating an almost transcendent experience, often without a word being spoken. This has happened to me just a few times in my years of study, when everything comes together. I do hope that all tea students out there are willing to put in the hard work to be prepared for something like this. Is it mastery? I don’t know. It is the way of tea. Practice constitutes learning from one, becoming cognizant of ten, then returning from ten to one, the beginning. Know that when training, learn from one to ten and return from ten again to one. This is another one of Rikyu often quoted poems. Learning from the beginning to ten makes sense as it is a logical progression. Returning to one again seems like going backward to us. But when we return to the beginning again, we gain new insights, perspectives and understandings because of the journey we have taken to the top. I very much appreciate teaching beginning students. It takes me back to when I was a beginning student and everything was strange and unfamiliar. There is this excitement of starting and the energy of something new. This state of mind is something experienced tea students strive for. Even though we have done the temae a hundred or even a thousand times, to make it seem brand new as if we are doing it for the first time and discovering it all over again is the challenge. Even going from advanced temae back to ryakubon, I gain something new about it. In other words I don’t necessarily return to the beginning again, but it is more like a spiral, coming back to a similar place but deeper and more meaningful. At every intensive, everybody, including the most advanced teachers go back to the beginning again. We start with bowing, walking, turning and moving in the tea room, then move on to folding the fukusa and handling utensils and purifying them. I always learn something new from these from these lessons. These lessons that I thought I knew, or I knew and forgot, or I knew but got sloppy bad habits. Last Friday we had an incredible opportunity to attend a raku pottery lecture and demonstration by my friend Richard Brandt. 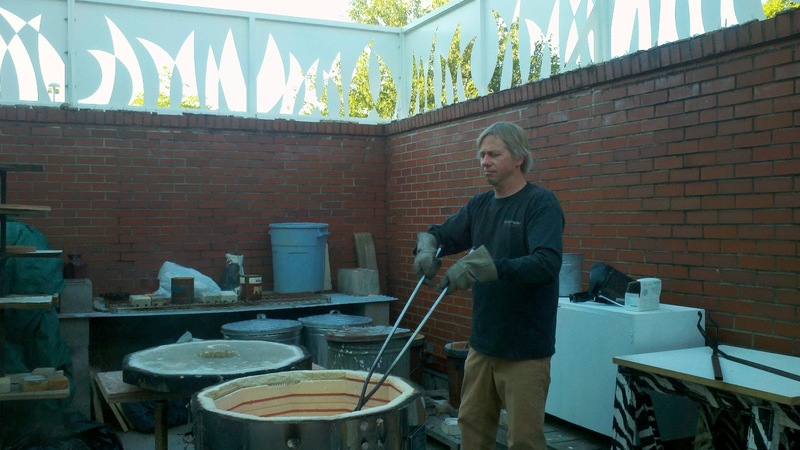 Richard is a tea student and teaches pottery so he invited tea students to attend his summer raku pottery class. 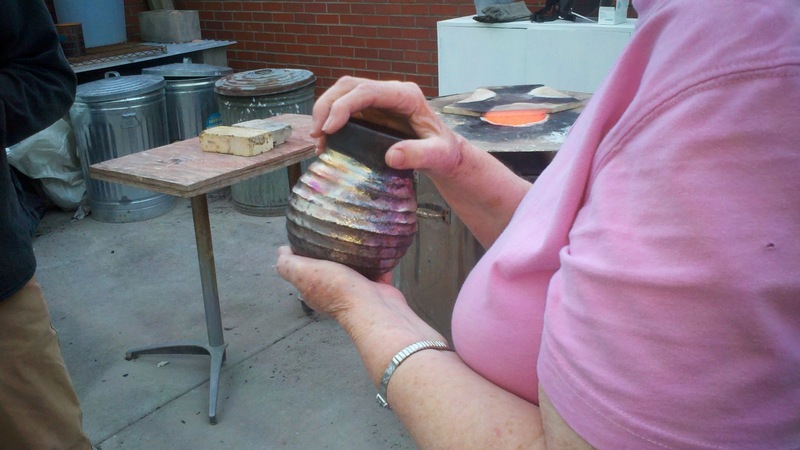 He put together a lecture about the history of raku firing and as a special treat, fired teabowls for us. 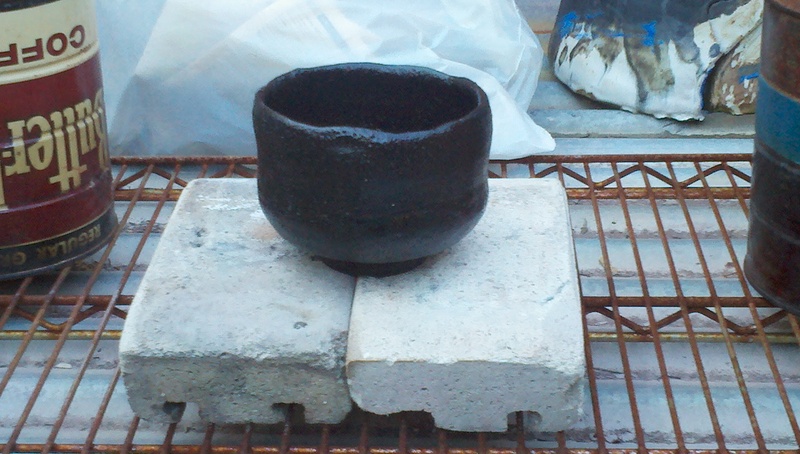 Through his own experimentation, and his special glaze, he was able to make black raku teabowls for us. Below are photos of the process. On the cooling rack. The coffee cans are used to slow the cooling down so the bowls don’t crack. 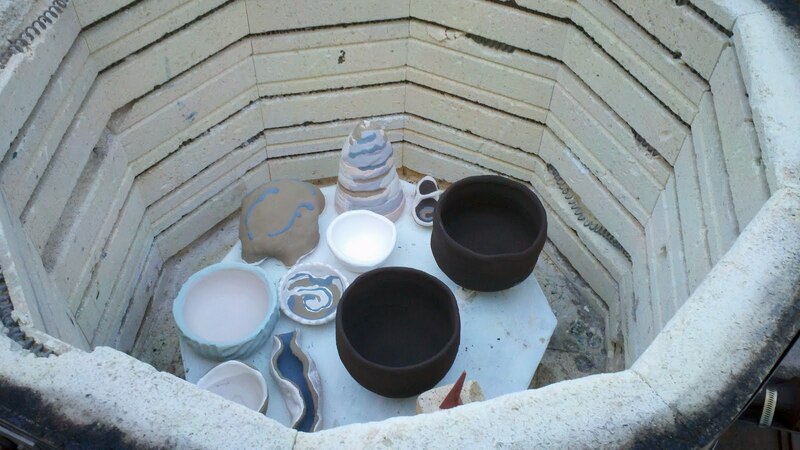 Other students in the class used newspapers and garbage cans after they pulled their pots from the kiln. Meet us at the Whole Foods Hollywood WingDing on Saturday July 2nd from 12-5 pm. They’ll be closing off 43rd Avenue between Whole Foods and the Bank in NE Portland, and making a party of it. Besides the Hot Wing Throwdown competition (vote the best wings), there’s going to be a beer garden, live music and exhibits from HandMade NW artisans (of which SweetPersimmon is one). I’ll be featuring handbags in my spacious 10 x 10 booth. Admission is free to the public. Wings are $.50 each with a minimum $2 purchase for voting ballot.10% of the proceeds will benefit the Hollywood Theater. enter on NE 44th between Tillamook and Sandy. I have scheduled an opportunity for students who are interested in pottery. Specifically, Raku pottery. My good friend Richard Brandt will be giving a lecture on the history of Raku and giving a demo of firing a black rakku style teabowl. Very exciting. Students, please don’t miss this opportunity. July 1 at 7:30-9:30 and PCC SE Center. Please sign up via email to me or let me know at class next week. Update: The lecture will be at 6:00 pm with the demo at 7:30. Please let me know if you are coming. I regret to inform you all that there will not be class again this week. Please be patient while we deal with this infestation. And to my guest Terue, if you read this post please call me to reschedule your visit. I apologize for the inconvenience to you. We will schedule a double make up in July. Please enjoy the summer evening on Thursday. Kokorozashi fukaki hito niwa ikutabi mo awareme fukaku okuzo oshifuru. To the student who has a deep desire to learn the secrets of chanoyu the teacher should spare no effort. One should spare no effort in teaching those with a deep desire to learn. I’d like to comment on this from both the student’s perspective as well as being a teacher. When I was an intermediate student, I was so hungry for anything I could get my hands on in learning more about Chado. And I must say that all of my teachers and all of my sempai have been more than generous to teach me what they know. The world of chado is so vast, and so deep, that nobody can know all there is to know about it. As students, we are attracted to certain aspects and not others. But every single teacher, sempai and student have taught me about the way of tea. They have taught me sometimes without knowing that I was learning. Even when I was not a good student and not paying attention in class, sensei would still try to teach me over and over again. I’d copy my sempai in the mizuya and try to pay attention when they were explaining things to other students. As a teacher, when a student is hungry like that, it is a joy to teach them. Sometimes a comment in class will motivate a student to seek even more knowledge, skill or technique. When students ask me for extra help, I always try to give them extra attention. I love the way of tea so much, that I want to share as much as I can with others who want to learn. It is even inspiring to me to have a student who is motivated to learn. By passing on what I know, the next generation of students will be able to carry on the tradition that love. The hototogisu is a kind of Japanese cuckoo (Cuculus poliocephalus). The song of the hototogisu traditionally signaled the arrival of summer. In other tales, the mournful cry of a hototogisu in a lonely wood was associated with the longing of the spirits of the dead to return to their loved ones still living. The hototogisu has long been a popular subject in Japanese literature and poetry, making appearances in both The Tale of Genji and The Pillow Book, and practically comprising an entire genre of hototogisu haiku. It is a convenient word in that it contians 5 syllables and when you add yama(mountain) it comprises 7 syllables. The hototogisu was said to spit blood when chirping – a synonym of tuberculosis. Since his diagnosis, he used his pen name, Shiki. Shiki is another name for hototogisu, meaning “little cuckoo”. He founded the literary magazine Hototogisu and patron to a number of young poets, Shiki played a leading role in the revival of the traditional waka and haiku forms. He advocated a realistic, descriptive poetic style, which he regarded as the original spirit of Japanese verse, and his poetic treatises greatly influenced the Japanese literary world in its quest to define modern Japanese modes of expression. There is also a flower that can be used for chabana called hototoguisu, supposedly named because the speckled petals are reminiscent of the breast of the bird. I have been meaning to talk about the 100 teaching poems of Rikyu, (Rikyu Hyakushu) and indeed, there are references scattered throughout this blog to them; all you have to do is search on Rikyu, but I will attempt to post the 100 poems with some thoughts on each one, including one or more translations. I will tag them so that when you search on Rikyu Hyakushu, they will come up all together. To have the mind to enter this path is, indeed to have an inherent teacher. I wrote about this poem previously: Who is the best teacher. That is not to say that you know more than your sensei, or that you should tell your sensei what and how to teach you, but it is through your own desire to learn that you will come to know tea. No matter how good a teacher you have, you will not learn it if you are not motivated. The way of tea is hard as is any endeavor worth pursuing your whole life. You must have the heart and the mind to pursue the way of tea. We will be doing a tea ceremony demo this Sunday at the Special Snowflake Supper Club, a roving dining series. This month’s theme imagines what would be served if “a Buddhist monk and a European explorer sat down and shared a meal.” Dishes are likely to include Tibetan barley bread, roasted wild boar leg, water buffalo jerky, and saffron-infused fish pie. The event starts off with “Cocktails and Commerce”, during which guests can “promote their cottage industries and small businesses then proceeds to the feast. We will provide part of the entertainment. Where: Bakery Bar, 2935 NE Glisan St.
Edited to add: There are only 20 seats left at the supper club. My apologies to Olympia Beer, that was their slogan for many years. I just returned from a trip to the Southwest, Arizona, Utah and Nevada. It made me appreciate the good fortune that I live in a place with really good tasting water right out of the tap. I tried to make tea with the water from the tap and my tea really tasted yucky. Sometimes it tasted soapy, sometimes salty, depending if it had gone through water softeners. This reminds me that good tasting tea starts with the water. Even though I live in a place with good tasting water, I use purified water because the pipes that the water runs in also make a difference in the taste. I am reminded again that my sensei told me not to use distilled water for tea, because it was too flat. The best water comes from spring or well water. We are fortunate here in the Pacific Northwest to have an abundance of springs, wells and very good tasting water, even out of the tap. There are some famous wells in Kyoto for good tasting water. 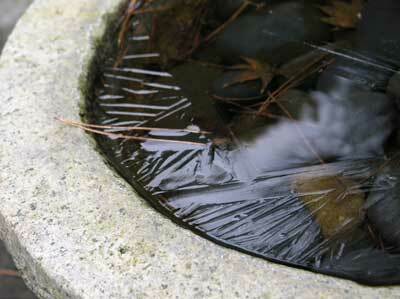 The well at Urasenke is called Ume no I, the plum well. Other places famous for good tasting water are the Ocha no I (tea well) located in the garden of the Ginkakuji, the Silver Pavilion once was a source for water for the Ashikaga Youshimasa; the Kikusui no I (chrysanthemum well) located at the Kongo family of Noh masters and used by Takeno Joo. Also Nashinoka shrine is supposed to have very good tasting water. And there is a spot on the Uji bridge called the Uji Bashi San no Ma where there is a special platform that extends out from the third piling from the Western end. The water that flows from beneath this platform is said to to originate from an underwater palace beneath the Karahashi bridge which spans the river in nearby Otsu City, or from an spring at Benziten Shrine in Chikubu Island in Lake Biwa. Hideyoshi used this water for tea when he resided in his castle in Fushimi. When I did my chaji in Kyoto, we used the water from the well at Kitano Temangu shrine. The best time to get water is between 4 and 6 am. So we got up early and went to the shrine to fill our plastic containers for the chaji and hauled them up to Toinseki for the chaji. This makes you very careful with water as there was no running water in the mizuya so what you brought from the well was all you had to use. There is even a procedure called Meisuidate for the preparation of tea with famous water that uses an unfinished well bucket made of hinoki cypress with special paper decorations. Before koicha is made, the guests get to taste the water from the well bucket. How to empty a kama. Make sure the lid is closed completely. Carefully put the kan in the lugs. Lift the kama straight up and be careful you don’t bump any part of the furo or ro with it. Hold the kettle close to your body, but not so close that you will be burned. Carefiully stand up and carry the kama to the kitchen. There should be a wooden stand in the sink to place the kama on. Removel the lid and blot it with a clean towel. Put it on a futaoki to cool. Carefully ladle hot water from the kama all over the outside with a hishaku. Take a few ladles of hot water and put them in another container (the chankin darai is a convenient place) Then take towels and pick up the kama to turn it over to empty it. (Be careful not to burn yourself). Place the kettle upside down on the wooden stand and ladle hot water over the bottom. Take the kama brush and swirl over the bottom of the kama in a circular motion. (Don’t take too long or the brush will burn). Ladle water and brush a couple of times. Turn the kettle over again and blot the inside with a clean towel. (be careful reaching inside). Put the kan in the lugs and lift the kettle onto a dry towel to blot the bottom. The heat from the kettle will begin to dry it. Remove the kettle to the burner where the residual heat will dry the inside as well. Make sure the burner is unplugged and won’t over heat the kettle. Let the kama cool before putting it away in its box. Never touch the surface of the kama with your bare hands. The oils from your hands and fingers could make permanent marks. Use the kan (rings) to carry and move the kama. Some people have a habit of carrying an empty kama with their hands on the inside of the mouth. It is just a bad habit and don’t do it. For a chaji we fill the kama with cold water and place it on the coals just before the guests enter the room. For class time we pre-heat the water and fill the kama. The procedure for doing this is to rinse the kama with cold water. You can use towels to turn the kama over to empty it (never use the kan to turn the kama over, you might break the lugs). Put some cold water in the kama, about one fourth full. Then, put a hishaku in the mouth of the kama and pour the hot water into the hishaku before it spills into the interior of the kama. Fill the kama near the brim. Use the hishaku to ladle hot water over the outside of the kama, wetting the whole surface of the outside. The proper level of the water should be one cup below the rim. Take a hishaku full of hot water and put the lid on. Rinse the top of the lid with the water from the ladle. Now you are ready to put the kan in and lift it from the sink. I should say here that the kan always travel together. Hold them with the openings at the bottom, and your fingers and thumb side-to-side. Separate them in each hand and twist them into the lugs of the kettle. They twist in opposite directions, and it takes some getting used to. Lift the kama and briefly blot it on a towel to get most of the water off the bottom. When you carry the kama, hold it close to your body but not so close that you can get burned and put it on the burner in the tea room. When you hear “kama tori masu” get out of the way because someone is carrying a heavy kettle full of hot water. I’ve had a request to talk about what to do with a new kama. So I dug through my notes from years past and here are some brief things to note. Even if you have a used one, it is a good procedure to use. Most of the teachings I’ve had in the mizuya about care of utensils have been from my sempai, so I’d like to acknowledge them for the information that follows. Once a kettle or tetsubin is cast, it is coated on the outside with a patina called ohaguro, “tooth-black” and the inside is coated with lacquer or some synthetic. To “cure” a new iron kettle or tetsubin, fill it close to the brim with fresh, filtered water, especially if the water in your area is high in minerals. You’ll have to have a source of such water anyway, since minerals change the taste of the tea. To this water you may add Japanese sake and/or green leaf tea, old matcha, even black tea as a last resort, and boil for several days or until the funny smell and taste goes away. You must boil the kettle for several hours at a time, replenishing it with pure water to keep the level topped up. After this treatment be sure to do one treratment of just pure water lest you find a soup when you go to make koicha. Do not boil directly on a gas burner. Rust is the oxidation of iron. Oxygen in the water vapor in the gas fire will rust the bottom of kettle just as fast, maybe faster than leaving it out in the rain. Best case is boiling over sumi, charcoal. So if all you have is gas, put an iron plate or something in between so that the gas does not get near the kettle. Some new kettles have a glass-like inner coating on them which is supposed to prevent rust. Nevertheless it is only a good cautionary practice to rinse and boil even these kettles once or twice before making tea in them. In 1747, shichijishiki or seven training exercises were created through the joint efforts of Joshinsai (seventh iemoto of the Omotesenke school), Itto (eighth iemoto of the Urasenke school) and the abbot Mugaku Soen of Daitokuji temple. It is said that it took ten years to develop the shichijishiki. In these exercises, participants choose lots to determine their roles to complete the exercices. The most simple is hira kagetsu where 5 participants draw lots from the moon, flower and ichi (one), ni (two), san (three) tiles to determine their place in the room. During the course of the exercise, 5 bowls of usucha are made and partipants choose the tiles from the orisue (pouch) to determine who makes tea and who drinks tea. The exercise requires participants to pay attention and be prepared to make or drink tea. It requires team work, timing and emphasizes walking and moving around in the tea room. I love kagetsu and there are many forms of kagetsu, just like there are forms of temae. For example: koicha tsuki kagestsu (one bowl of koicha everyone drinks and 4 bowls of usucha), sumi tsuki kagetsu (charcoal is layed and 4 bowls of usucha are made) and so on. It is fun and I hope to be bringing this form of training to our classes soon. I had always thought of this motif as whirling commas and in fact, it represents a whirlpool in water. My dictionary defines tomoe as a whirl or eddy. This symbol is used as protection from fire. You can see it on roof tiles and other places for fire protection. In Heian times, the Saionji family used it on thier carriage. During the Kamakura period, it became a popular design motif for garments, household objects, and military items. Later, it was made into the mon or crest of the Hachiman shrine and represented thad God of War. I just wanted to let you know that I my handbags were featured at Portland Sewing’s Fashion Show last Saturday and I will have a booth at Portland’s Handmade NW on May 3 and 4. The sales support the Heart Research Center. (Also go to support this blog) If you can’t make it, I will be putting some of my creations on SweetPersimmon. There will also be a chanoyu presentation at the Japanese Cultural fair for Children’s day in North Portland. I know that I need to do more blogging because there are so many things going on. Yesterday, I was at the Clark College Sakura Festival in Vancouver, WA. I don’t know if you know this, but SEH America has a plant in Vancouver the president and CEO of SEH America has donated a million dollars for a Japanese Garden on the campus of Clark College. 20 years ago 100 cherry trees were donated to the city of Vancouver as part of the sister city, rotary relationship with Joyo, Japan. The new garden (alas, no tea house) will incorporate the mature cherry trees. They will break ground this summer and plan to dedicate the new garden in the fall. Something to look foward to. This month the Portland Japanese Garden will begin tea presentations at Kashintei, the tea house. Every third Saturday from now until October at 1 and 2 pm, members of Kashinteikai will present chanoyu. Our open house on April 6 was so well attended, that we will be doing more of them this year. Please watch this blog for times and dates. Also, I plan to offer guest etiquette classes, wagashi making classes, and kaiseki cooking classes so we have big plans and I hope you can join us. I can’t believe that it has been four years of blogging. I just went back to review some old posts. Go ahead, explore the rest of the blog. I have a group of new students and some of them have told me that doing tea looks so simple that anyone can do it. That is until we start whisking matcha, or walking in the tea room. When we begin training in something like tea, it seems like we start with the boring stuff when what we really want to do is to make tea. I started training and it was five months before I made tea. I started with cleaning tatami mats, preparation work and learning to be good guest before I made tea in the tea room for anyone. Someone said to me that people fall in love with the idea of Rikyu’s tea, but when they begin tea training they are disappointed to have to follow the rules and do boring stuff like clean tatami. They just want to make beautiful tea. It is like going to a concert to hear Yoyo Ma play cello, but when they want to learn the cello, they are disappointed to have to do boring things like learning bowing techniques, tuning your instrument and playing scales when they just want to play Bach’s sonata. My husband is a wood worker and he does the most incredible work. 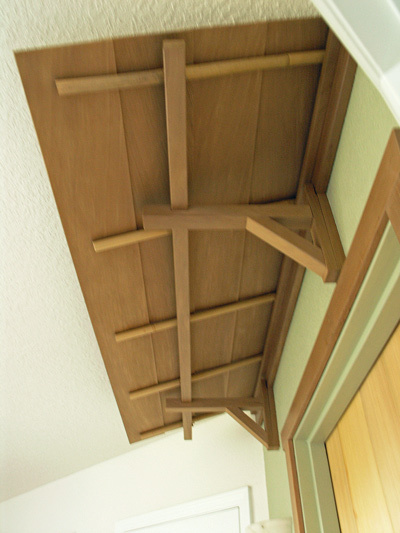 However, when he makes a Japanese joint in two pieces of wood, it just looks like two pieces of wood come together. But what is hidden is the complicated carving and fitting that goes on inside the joint so that the two pieces of wood lock together without nails or screws or glue. It is simple, beautiful and will last a lifetime or more. It seems like many things in life we don’t see what is going on inside or behind the scenes. We see successful athletes and marvel at their incredible talent, but don’t see the hours and hours and hours of practice in the gym or on the field. We see successful businessmen, but don’t see the sacrifices to social and family life. We see artists and craftsmen, masters of their art, but we don’t see the years of training, struggle and financial sacrifice. It’s like we expect to be exceptional at something without putting in the time, practice, training and sacrifice. Most people don’t want to put in 25 years of tea practice, or spend weekends and nights for years getting a business started. Most people don’t pull consistent all-nighters to nail some key projects, putting them in place for a big promotion. But if you want to do something badly enough, you will do what ever it takes to make your dreams reality. You need passion to get you through the the tough times and difficult choices you need to make. They do say that nothing worthwhile comes easily and especially nothing worthwhile will come your way without you driving yourself.. Every day is a choice with how you spend your time, how do you choose? It has come to our attention that raising funds without being a registered charity is illegal. Therefore our event on April 3rd will be to share a bowl of tea in remembrance of the Japanese people. For those who wish to donate to the cause, we will have a list of registered charities that you can donate funds. We apologize for expectations for our event. Thank you to those who have registered. Please come share a bowl of tea and sweets. On Sunday, April 3rd from 2:00 pm to 6:00 pm, the Ryokusuido Tea Group will be hosting a fundraiser. Please join us for a bowl of tea and sweets at Ryokusuido Tea House. All donations will go to relief for those affected by the earthquake and tsunami. Please call 503-645-7058 for reservations. I cannot tell you how worrying and traumatic it has been the past week watching the news and waiting to hear from friends and family members in Japan. Our thoughts and prayers are with everyone who was affected by the earthquakes and tsunami. We are concerned with the ongoing humanitarian crisis and threat of nuclear disaster as well. Red Cross officials say donors can text REDCROSS to 90999 and a $10 donation will automatically be charged to donor’s phone bill, or donations can be made directly on its Web site. Information is available on the organization’s Web site. CARE is one of the world’s largest private international humanitarian organizations. Their offices in Asia are on high alert and have ensured that staff are informed of the tsunami warnings and other related developments. GlobalGiving is working with International Medical Corps, Save the Children, and other organizations on the ground to disburse funds to organizations providing relief and emergency services to victims of the earthquake and tsunami. Donors can text JAPAN to 50555 to give $10, and larger increments can be submitted on GlobalGiving’s Web site. The Salvation Army has been providing food and shelter to Tokyo commuters who were stranded when public transportation was interrupted by the earthquake. They are to send a team to Sendai, a city about 250 miles Tokyo, to assess the situation there. Text JAPAN or QUAKE to 80888 to make a $10 donation. (Make sure to respond “YES” to the Thank You message you receive.) Donations can also be made on the organization’s Web site or by calling 1-800-SAL-ARMY. To make a donation, visit Save the Children’s Web site, call 1-800-728-3843, or text JAPAN to 20222 to donate $10. Shelterbox.org is a disaster-relief organization that focuses on providing survival materials such as tents and cooking equipment to families displaced by disasters. Information is available on the organization’s Web site or by calling (212) 836-1486. P.S. Thank you to all of my well wishers for my birthday. The celebration continues as it is still my birthday week today, and golly we’re not even half way through celebrating my birthday month, let alone one third of the way through my birthday year. It has been seven years since Minako Somi Frady passed away, and today we remember her with a chakai at the Portland Japanese Garden. She was my sensei for more than 20 years and we all miss her terribly. In many ways it doesn’t seem like very long, and in other ways it seems like she has been gone forever. Since I started teaching, I long to have conversations with her regarding students, teaching methods, and just some philosophical discussions regarding real life and tea. “If I give you the answer, you won’t remember it.” And it has been so true. Easy answers are forgotten quickly. While the hard won answers that took cogitation, endurance, sweat and mistakes are the ones that stick with me. Thank you Minako sensei for teaching me. Thank you for putting up with my ignorant, rude behavior as a beginning tea student. Thank you for being so strict with me and teaching me the traditional way. Thank you for the love and care you gave me through more than 20 years of tea studies. Thank you for believing in me. Thank you for letting me go. Every year Christy Bartlett sensei comes to Portland for an intensive weekend of study. Usually there is a Friday afternoon study, all day Saturday and all day Sunday. We are very lucky to have this opportunity to study. As with all koshukai, everyone participates with warigeiko, the basics. And even though I have been taught the basics every year for many years, I still learn many, many things during this part of the koshukai. For example, We started this year with posture, sitting,bending, reaching and hand placements. Then how to sit, stand, walk and turn. We went on to cover the proper placement of your fukusa, kobukusa and kaishi in your kaichu– or front of your kimono. Paying attention to these details makes me more aware that I don’t always pay attention to the details of my own temae. And while doing things properly in warigeiko doesn’t always mean that I pay attention to the exact things I learned in temae when so many other things are going on. The lesson? Be aware and pay attention to yourself even during the parts of temae you have done a thousand times before. After warigeiko usucha and then koicha temae were done, where we could put all we learned into practice. This year Christy also concentrated teaching shichijishiki, or the group training exercises. Originally there were seven of them, which I will cover in a post another time. This koshukai we had enough experienced people to do some of the more advanced exercices. We began the afternoon with hira kagetsu on Saturday — where 5 people draw lots to determine placement in the room and of 4 bowls of usucha, who will make tea and who will drink tea. Next we did koicha tsuki kagetsu, where one person makes koicha, all 5 drink and then 3 bowls of usucha are made and drunk chosen by lot. On Sunday we started with satsubako tsuki kagetsu — two bowls of koicha that everyone drinks and then 3 bowls of usucha chosen by lot who drinks and who makes. The next exercise was gyakygatte hira kagetsu — 4 bowls of usucha are made and drunk, but with the additional twist of reversing the room so that the guests are opposite and tea is put out by the left hand. After that we did shaza — where the 2nd guest arranges flowers, the 3rd guest lays the charcoal, the first guest prepares incense, the host makes koicha and the hanto makes usucha for the host. The final exercise was chakabuki — the host makes 5 bowls of koicha. Two of which are known, 3 unknown. The 4 guests must taste the tea and identify which tea in the order it was made. All of the answers are recorded and the record of the exercise is given to the person with the most correct answers. As you can see, by drawing lots, you never know what role you will play until you draw for it, so all participants must be ready to perform whatever task he has drawn. Because of specific timing, everyone must pay attention and because of the traveling to and from the temaeza, you must concentrate on correct footwork. There is a lot going on all at once and all 5 participants must work together for the exercise to be successful. This is also an endurance training, because if you are not participating as a host, guest or participating in the group exercise, you must sit on the sidelines in seiza to observe the proceedings. That’s a lot of hours of sitting in the entire weekend. For relief, I recommend Working Class Acupuncture. This is book is the story of Kitcho, a kaiseki restaraunt with a premier reputation in Japan. Chef Tokuoka relates how is grandfather began serving meals based on historical records of tea ceremonies given by Matsudaira Fumai. Kaiseki was typically not available unless you were invited to a tea ceremony. Today, thanks to Kitcho’s founder, Teiichi Yuki, the principals of seasonality, simple preparation and beautiful presentation of the kaiseki meal is firmly planted in the mainstream of Japanese haute cuisine. The book is divided into five sections: Spring Kaiseki, Summer Kaiseki, Fall Kaiseki, Winter Kaiseki and The Kaiseki Kitchen. The seasonal sections feature exquisite food photography of different seasonal dishes. The text combines commentary by chef Tokuoka and historical and cultural asides; from Rimpa style painting to court poetry that has inspired the menu. The last section is a look behind the scenes at Kitcho in the kitchen. This section also includes a recipes for dashi and sauces, food notes to the seasonal dishes presented and a glossary of food terms. The photographs in the book are outstanding. Not only are there photos of the kaiseki dishes, but also elements of tea such as chabana, the tokonoma, teabowls, calligraphy, and sweets. You will enjoy this book as inspiriation for your next chaji, and perhaps learn a little more about the history and culture of Japan. Students will participate in at least six tea ceremonies, an incense ceremony, and kimono dressing. Japanese architecture, gardening,ceramics, flower arranging and calligraphy will also be covered. The final class will be a formal tea gathering for friends and family at the Portland Japanese Garden authentic tea house. New Class: Starts Wednesday, Wednesday March 2 7:00 – 8:30 pm. Fee: $250, materials will be available for purchase at class. Sometimes we stop going to class for different reasons. Jobs change, moving, heatlth reasons, family obligations. And sometimes we just need a break. Coming back to class, it seems like we have to start all over agian. Classmates have progressed while you were away; your body doesn’t obey, and you have forgotten even the most basic moves.It can be intimidating and discouraging. A friend of mine has recently returned to the Pacific NW after six years on the East Coast. He left to pursue a job, but there was no teacher where he lived. Returning to tea class was a great joy to him, only there were younger students in his class that had been studying for less time than he had been away and were so far above him doing advanced temae. He felt like he was starting over at a disadvantage. In times like these, sometimes it helps to change your perspective. The way of tea is not a competition. Each person has his own path and lessons to learn from tea. Where you are in your studies is where you need to be. Some of the most respected chajin have only the beginning certificates. What really matters in Chado is not how many advanced certificates you have or whether or not you are keeping up with your classmates. It is not how quickly you master the temae, nor how many beautiful utensils you have.collected. It doesn’t matter how long you have studied or how much you know about the history of tea. What really matters is how you conduct yourself, how you are in the world. In tea we value the “humble but eager heart of the beginner.” Advanced tea people try to return the state of mind of seeing and learning something for the first time, even though they have done it a thousand tiimes before. The SweetPersimmon site is way of funding this blog. I have updated the site with a new look and you can now get 25% off all products in the store until March 31, 2011. Just use this coupon code when checking out. Thank you all for your support. You can always donate to keep the blog going, just use the Donate button to the left. One of our students planned a lovely New Year’s Party at a new local Japanese restaurant in Portland, Shigezo. We had reservations for one of the tatami rooms and all the students (yes even the men) came in Kimono. It was a lovely party, the food was good — even the giant sushi roll — and everyone who attended got a gift. Thank you Michelle for setting this up. I know for many of you sweets are one of the reasons that you come to class to drink tea. I hope you have all appreciated my poor attempts at home made wagashi. This sweet is called hanabira mochi. It is the traditional New years’ sweet of Urasenke. I love the taste of this sweet for it mix of sweet and salty flavors. For those of you in Seattle, there is now a professional tea sweet maker called Tokara. Tokara is a Seattle-based confectionery that prepares only freshly made Japanese sweets known as wagashi. These traditional Kyoto-style confections are crafted to reflect the seasonal changes and the beauty of nature in color, shape, and taste. Handmade by Chef Tokara, a selection of wagashi echoing the current season of the year – be it spring, summer, fall, or winter – are offered monthly. You can also have a bowl of sweets at the Seattle Urasenke Branch. Contact them to schedule a visit. Thank you to the guests who attended Issoan Tea School Hatusgama. I enjoyed hosting you so much that I want to do it all over again. Here are the photos from the event. New Class: Starts Wednesday, Wednesday January 12 7:00 – 8:30 pm.